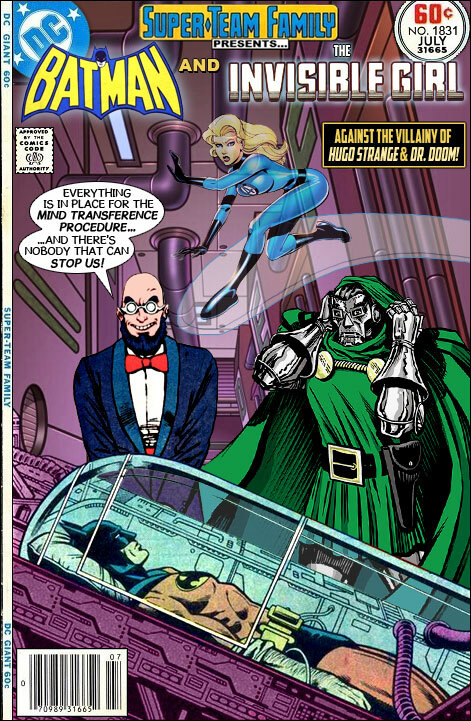 I've been hoping that Hugo Strange would bet a chance at being that main villain in a Batman movie. I have enjoyed B.D. Wong's performance in the role on Gotham, and that just makes me want to see the character make the leap to the big screen even more. Besides being a great psychological antagonist to the Dark Knight, his Monster Men experiments could be a way to bring Kirk Langstrom/Man-Bat into the mix as well. Interesting. Have they brought Rupert Thorne into the show? I like your idea of Hugo Strange in a Batman movie. As for his Monster Men, I think that it could also possibly include Killer Croc, Amygdala, Lunkhead, Humpty Dumpty, Lupus, and maybe even Tweedledee & Tweedledum as part of his experiments. *Why they did, in the first place, has always bothered me. Personally? I think they read his mind, after rescuing him from deep space, and learned he had studied with that Himalayan cult. One they had probably made contact with in ancient times! With Doom's mind in Bruce's body? Any other procedure would be superfluous. Strange has already deduced Batman's secret identity correctly, anyway. >>Batman and Invisible Girl first met back in my MS Paint B&B days. It's fun to go back and see previous "meet-ups" among the characters. But I notice that the Bat-dude was helpless in both covers. Maybe someday Bruce & Sue can meet up when he's not inert and helpless? Ever thought of doing a cover of people who can turn invisible (Sue Storm, Martian Manhunter, wasn't there someone from the Legion of SH, who else?) -- and not actually show any of them on the cover? There have been two Invisible Kids in the LSH (Lyle Norg and Jacques Foccart), and if you count cloaking devices, you could add Space Ghost's crew to The Invisibles. Ross gets the suggestion for the blank cover for every April Fool's Day. Personally, I hope he's saving it for the next Assistant Editor's Day. How do you know that I haven't already done it and you just can't see it? How? He/she probably checked your excellent index. I mean what if you can't see it because it's invisible.